For today's post I decided to make a card with the colors from this week's Pals Paper Arts color challenge. 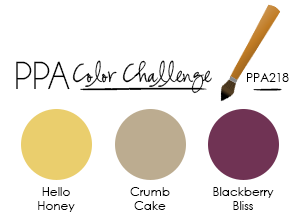 Here are the colors for this challenge. Two of these colors, Hello Honey and Blackberry Bliss, are from the new InColors introduced this year. First I really love Blackberry Bliss. In particular the cardstock has a really wonderful rich look that just can't be conveyed on a computer screen! You really must see it in person to totally appreciate it. The color looks wonderful with Hello Honey! Here is the card I made with the challenge colors. I love the Starburst Sayings stamp set, especially when combined with the Starburst Framelits. The pointed edges of the cutout images give the pieces a modern trendiness and the Oh, Happy Day is perfect for so many different occasions. It is such a nice solid image that is great to heat emboss and in this case I wanted to do the embossing in the rich Blackberry color. I also heat embossed the small circles and added a tiny Honey circle made with the Owl Punch. Using the Finishing Touches Edgelit I repeated the edges on the top and bottom of the DSP layer and on the envelope and liner. So cute, Katie! What a great use of these colors. It screams, "HAPPY!" Katie, I love that you continued the starburst sawtooth edge throughout the card and envelope! Such a fun bright card to share with the PPA this week!! Thanks Katy (and Brian)! I really appreciate your comments. I just love that edge and can't figure out why people don't use the Edgelit more. Katie, I never thought about putting the framelits and edgelits together to "match." Thanks for the idea and for playing at PPA this week. Come back soon! Super cute! I love all the starbursts together. Super fun and bright, this will cheer anyone up. Thanks for having fun with the PALS this week! Great way to use this stamp set. Thanks for sharing.